GDevelop allows you to publish your games to any modern platform! However, the game needs to be exported first. 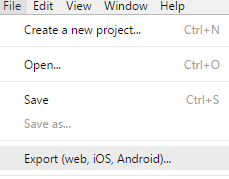 In order to export the game, click File on the menu bar above the GDevelop Interface. Select the Export option from the popup list that appears. Android (and iOS coming soon): this prepares your game for Android (and iOS support is coming soon). It builds it online, using GDevelop online services. Then sends you a link so that you can install it on Android and publish it to the Play Store (or App Store later for iOS). Facebook Instant Games (Messenger): this prepare your game so that it can be uploaded on Facebook Instant Games and played on Messenger, shared with your friends and then published worldwide. Web (upload online): this option will upload your game to GDevelop hosting, for free. You can then share it with anyone with a click of a button. Windows, macOS & Linux: this option bundles your game as a Windows, macOS or Linux application, build it online, using GDevelop online services, and then send you a link so that you can distribute the game. Export to a local folder: this option allows you to export your game in to a folder and upload it manually to any host you want or wrap the game in to a desktop or mobile application manually using any tool you prefer, like Electron. 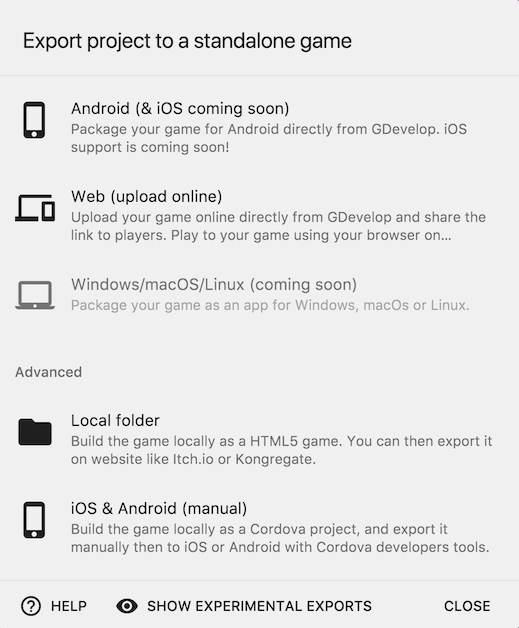 iOS & android (manual): this option is going to export your game ready to be used as a Cordova project. You can then use Cordova command line tools to build your game for Android and iOS. Windows, macOS and Linux (manual): this option is going to export your game ready to be used as an Electron project. You can then use command line tools to build your game for Windows, macOS or Linux. Cocos2d-JS: this option is going to export your game, using Cocos2d-JS as the game rendering engine. You can then use Cocos2d-JS command line tools to build your game for Android, iOS or as a desktop game. Ubuntu Touch (Mobile): this guide will take you through the process of packaging your game as a Click package for Ubuntu Touch.